Warning: This is a technical canyon with a semi-keeper potholes, you will need a full set of canyoneering gear (helmet, webbing, rap rings, harness, belay device, carabiners, and a minimum of a 1x 50 ft rope. This canyon has some deep water and may be quite cold. A shorty might be fine for summer if you’re warm blooded, but a full wetsuit or drysuit might be preferrable, especially if conditions are difficult and you spend a lot of time in the water and/or potholes. Experienced canyoneers only, you are responsible for self-evaluating your abilities. Danger: always check the weather before entering a slot canyon, don’t put yourself at risk of a flash flood! Hike: The hike began at the end of FR 142E. From the parking area (6,600ft). Walk back up the road about 20 minutes and then turned west into the woods where you’ll descend quickly into a leaf covered wash. Continued on in a Northwest route back up, out of this wash. There is a faint trail—either from animal or human. Within a few minutes you’ll end up on a short Forest Road heading North toward West Clear Creek. leave the road to the North and descend into Bear Canyon. The canyon floor will became rockier and then the walls will slot up as you continue down canyon. There are a few shallow pools that can be avoided. Within about 30 minutes you will come to back-to-back drops, approximately 40 feet each, both of which could be skirted to the right with out gearing up. After the second drop, you will approach the first obstacle. 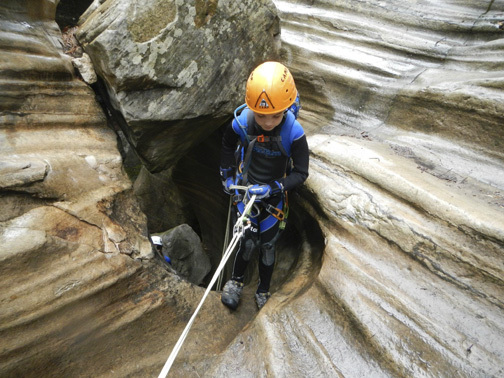 This first obstacle can be downclimbed, but it is slick when wet so gear up and make the short 8 foot rappel under a large chockstone. This is where the canyon becomes technical. After teh first rappel you will find another pool that is easier to wade through than try and skirt—bear is a slippery canyon. After this you will come to a frigid semi-keeper. You will have to slide into the pool. The water is deep and you’ll have to swim across and pull yourself out through a narrow pass-through on the opposite side. The second rappel is into knee water. After this you’ll shimmy across a log above a pool and end up at a eight foot downclimb or rap to a floating log. Cross the log and continue down canyon where it opens briefly to a fern blanketed area that is good for a quick bite. The canyon narrows again to one last pool to wade or swim through depending on water levels. Once out of the narrows you can either ascend the hill to the right or continue down canyon to West Clear Creek. Once at West Clear Creek turn right and cross the creek wading in and out of the water until you get to the large pile of wood on right side of the creek. The trail to the top starts here. It is about 600 ft and a 1/4 of a mile up back to the parking area. Directions to Canyon: From Phoenix, take I-17 N to exit 287/HWY 260. Take 260 East and just before milepost 249, turn left/north onto FR 144. Take FR 144 1.8 miles and turn left onto FR 149. Follow FR 149 1.1 miles to a T junction with FR 142. Turn right onto FR 142 and follow it .8 mile to FR 142E on the left. Turn left on 142E and continue 2.7 miles to the end.